It’s hard to believe that a month which started with temperatures so far below normal through the first 10 days would end up above average on the month. It appears, however, as though this will be the case thanks to a streak for 10+ days with well above normal temperatures going into this weekend. We are now running 1.5 degrees above normal for the month with just a few (albeit cooler) days to go. For precipitation we saw pretty much the same thing. The month started well above normal thanks to an active storm track, but we’ve been significantly drier over the last 10 to 12 days. As of this posting DIA is running 0.09 inches below normal for the month. With a decent chance for storms Monday that may change before the month ends Tuesday. We made mention of this before the weekend and it appears to still be the case, the coming week will feel much more like fall than it has in recent weeks. There will with a few chances for precipitation, and temperatures back near (to even below) normal. Average daily maximum temperatures drop to 70 degrees by the end of the week, and into the 60s during the first full week of October. With that, the upcoming shot of cold air will be less impressive as compared to normal than that which we saw to start the month of September. Regardless, our midweek week cold shot should serve as a great reminder what time of year it is, and when compared to last week afternoon highs will be significantly cooler, some 25 to 30 degrees cooler. 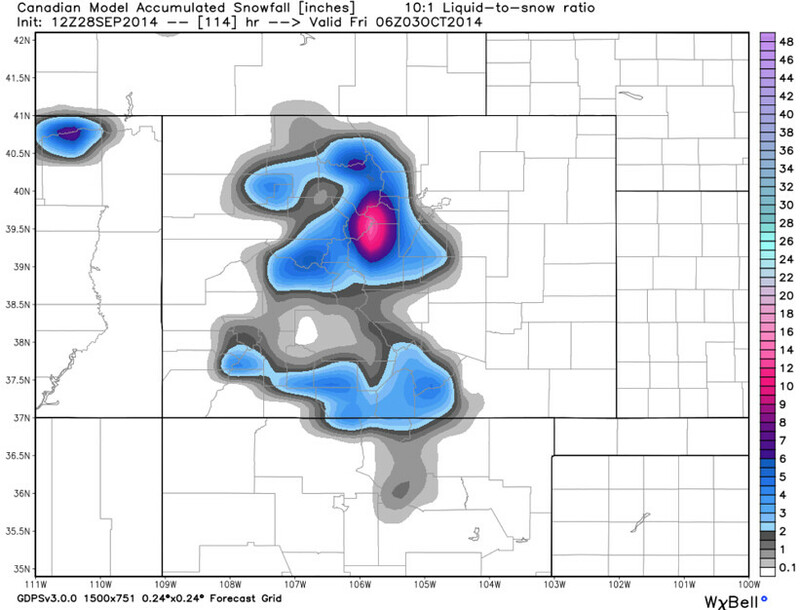 The first system we’ll need to watch will impact eastern Colorado later Sunday through Monday. This system will bring the potential for severe storms across the plains Monday afternoon and evening, with a few strong storms possible Sunday evening, especially north along the Colorado/Wyoming state line. 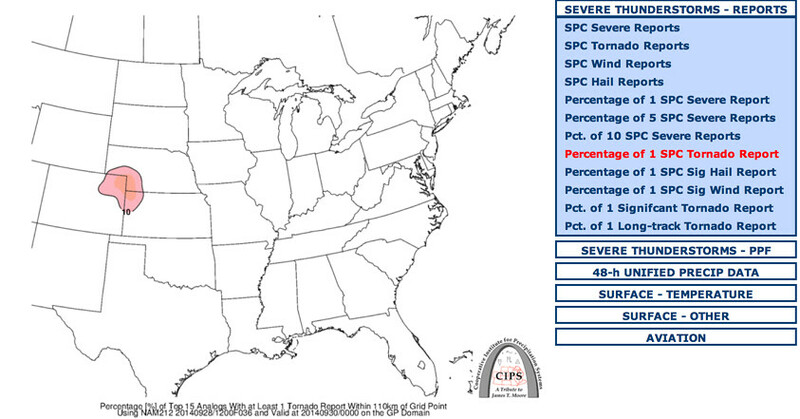 There should be sufficient ingredients Monday afternoon for at least a few severe storms across northeast Colorado. Greatest severe threat will likely be east of Denver proper where CAPE values will be marginally higher, and PWAT values could approach 1 inch. While the threat for strong storms and heavy rain will be lower in Denver, we’ll keep the Denver area in the 30-50% chance range for now. CIPS analogs have been rather consistent over the last several days with showing a severe weather threat for this setup, and this certainly seems plausible. The Storm Prediction Center also is watching for the potential for severe weather Monday issuing a Slight Risk outlook for much of eastern Colorado. 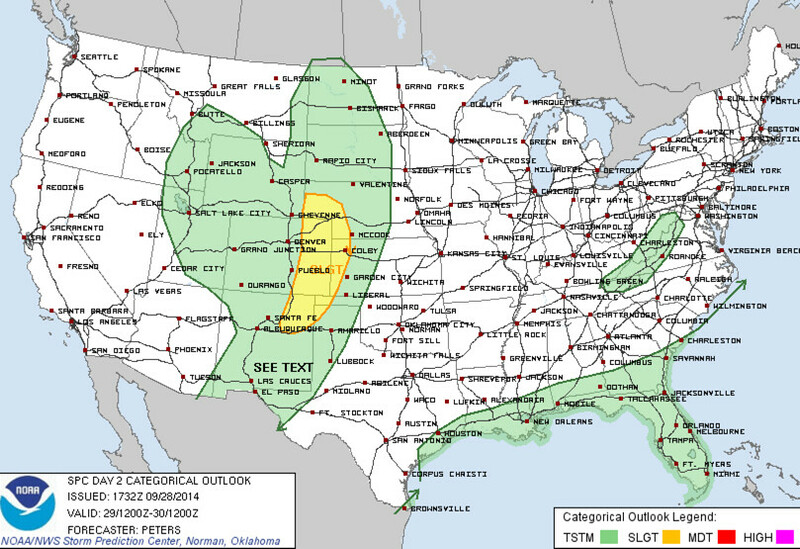 Note the yellow polygon is just east of the Denver metro area. Precipitation totals Sunday through Monday night will be greatest along and north of I-76, and again east of Sterling south to La Junta. We’ll keep a good chance of storms going from Denver south, though expect precipitation totals and storm chances to be lower than much of the rest of the state. Second system cooler Our second system will bring cooler air with it and arrive Wednesday. This system will have Pacific origins, so temperatures will be moderating as the push into Colorado and eventually the middle of the country next weekend. Recent model runs, however, have trended cooler after being all over the map last week. While it is looking like we’ll see another round of precipitation with the second system this week, at this time it does not look cold enough for snow at lower elevations. Temperatures will tumble though, especially by early Friday morning. 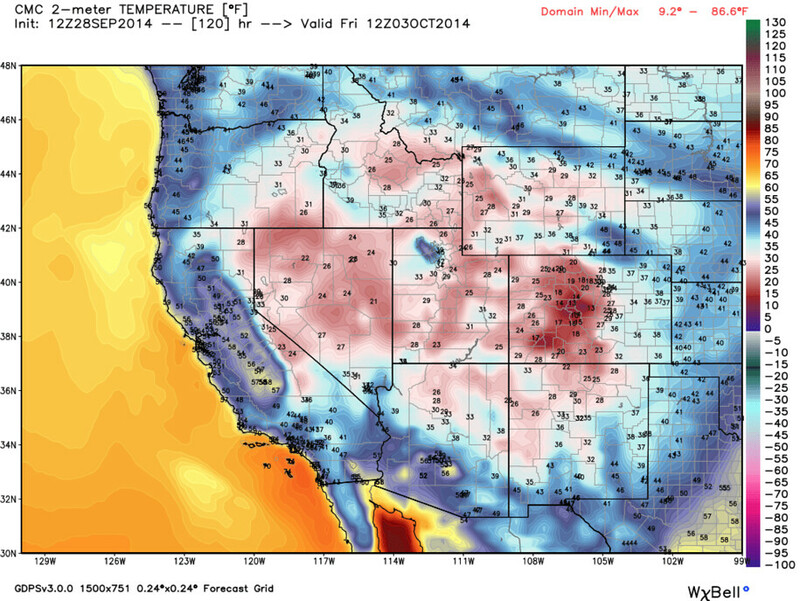 The Canadian which has been the most consistent in handling this system over the last week has temperatures between 30 and 32 degrees across the Denver area by early Friday, with even a few upper 20s across higher elevations to the west. The EURO/GFS are both running about 10 degrees warmer for the same time Friday morning, so the cold is certainly not a done deal. I suspect the most likely scenario will be a compromise, with most locations see 30s by Friday morning. As for snow… again, it should be too warm for most locations at lower elevations to see snow with this system although today’s 12z Canadian does try and bring a quick dusting to Denver’s western and southern suburbs. Like with the temperatures, the GFS and EURO are both far less gung-ho with regard to snowfall, and like with temperatures I think we’ll start to see a compromise over the next 24 hours. I think some of the higher peaks will see several inches from this storm Wednesday night into Thursday. Still plenty of time to watch the midweek system, so will leave it at this for now. First let’s get our rather dynamic system tonight and Monday, then see how things are starting to shape up for Wednesday. Getting to be that time of year again folks! Not subscribed? Please do so to be kept ahead of the snow this winter!